Houston, TX. – January 10, 2019 at the Leon Grayson/Baldree Community Center residents of Sterling Forest Subdivision met with Harris County officials concerning flood reducing projects in their neighborhood. On August 25, 2018, Harris County voters approved $2.5 billion in bonds to finance specific flood damage reduction projects throughout the county which included projects in Sterling Forest subdivision. A total listing of 104 subdivision drainage improvement projects have been identified as part of the bond program. 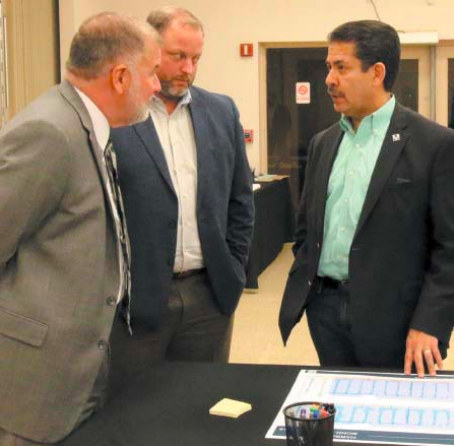 Additional projects may be added to the list in the future or projects on the list could be modified based upon public input and other factors if authorized by Harris County Commissioners Court. Before a final report on each project can be presented to Commissioners Court for approval for construction there must first be opportunities for further community engagement for each project. To develop the final report and as part of the preliminary engineering process the Harris County Engineering Department (HCED) and the County’s Flood Control District is conducting public meetings in a primary project watershed to solicit public comments about the project. From these meetings the HCED will prepare a preliminary engineering report to support the advancement of these projects toward final design and construction report to give Commissioners Court. Drainage projects is to improve the internal drainage systems and related infrastructure that take storm water from neighborhoods to major drainage channels or bayous maintained by the county’s Flood Control District. Internal drainage systems include underground storm sewer systems and roadside ditches. The streets in Sterling Forest proposed to have drainage improvements is Donfield, Deercrest, Terryhollow, Stonyridge, Hollycrest, Ivy Hollow, Deerpass Dr., Canna, Onaleigh and Grassmont. For a list of drainage projects and community meetings visit, www.hcfcd.org.